A lock down hard spa cover will help to prevent children and pets gaining unwanted access to the spa. A cover will protect the spa shell from the elements, particularly the sun, which in time will cause cracking of the acrylic and perish controls. A hard cover will prevent dirt, dust, leaves and other debris from getting into the spa. Foreign matter in the spa will upset water balance and look unsightly. If your spa is in the open, a cover will keep rainwater out. Again, this is vital for maintaining correct water balance. Your cover should have tapered foam inlays for water run-off. Ideally 100 - 55 mm taper. ​A spa cover will reduce chemical usage and time spent on maintenance. Keeping correct chemical balance of your spa water will depend upon keeping rainwater out, debris out and preventing leeching of chemicals by direct sunlight. ​A cover will prevent algae from growing in the spa. Algae growth is dependent on sunlight. A spa cover will keep out insects such as spiders and slugs. Unfortunately cockroaches and ants have a backstage pass. See the troubleshooting section for ways to deal with these pests. Heating up a spa without a cover is like boiling potatoes without a lid. It's a waste of time and energy. You will dramatically reduce the heat-up time, saving money and enabling you to manage your time better. 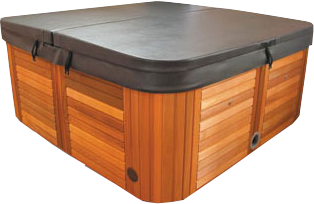 ​A spa cover will help retain your spa's water temperature between uses. The foam core of your cover is a spectacular insulator. It will prevent heat loss overnight, further reducing your next heat-up time ( you are not starting to heat the water from scratch ). This will allow you to have a spa at your convenience without the usual delay. Preventing evaporation is vital now. An exposed spa can lose a significant amount of water this way, especially if water temperature is warm. A spa cover will prevent water loss through evaporation. ​A spa housed in an enclosed area such as a room, will create a lot of condensation. A spa cover will reduce the effect of condensation when the spa is not in use. A spa cover should be considered as an energy saving device. A well made spa cover will improve the overall look of the spa area. Although this could be considered a debatable benefit ( some people prefer to sight the spa water ) a spa can look mighty unkempt without a lid. If you've ever had a spa full of either dirt, sand, leaves, branches, insects, toys, algae etc, you will learn to love the look of a spa cover. Finally, I asked a thoughtful 8 year old if she could imagine the benefits of owning a spa cover. She highlighted many of the reasons above and then came up with something I hadn't really considered before.
" A spa cover will stop your spa filling up with rain and over-flowing." Check out the range of Spa Covers available, their features and what they cost.